The 653, 626, and 427 all receive a new X9 LTE modem and support for Quick Charge 3.0 and dual cameras. This X9 LTE supports Cat 7 downlink speeds of up to 300MBps, and Cat 13 uplink speeds of up to 150Mbps (up to 50% better than the X8 LTE's uplink speeds). It also supports LTE Advanced Carrier Aggregation with up to 2x20MHz in both downlink and uplink, 64-QAM in uplink, and better call clarity and reliability on VoLTE calls with the company's Enhanced Voice Services technology. 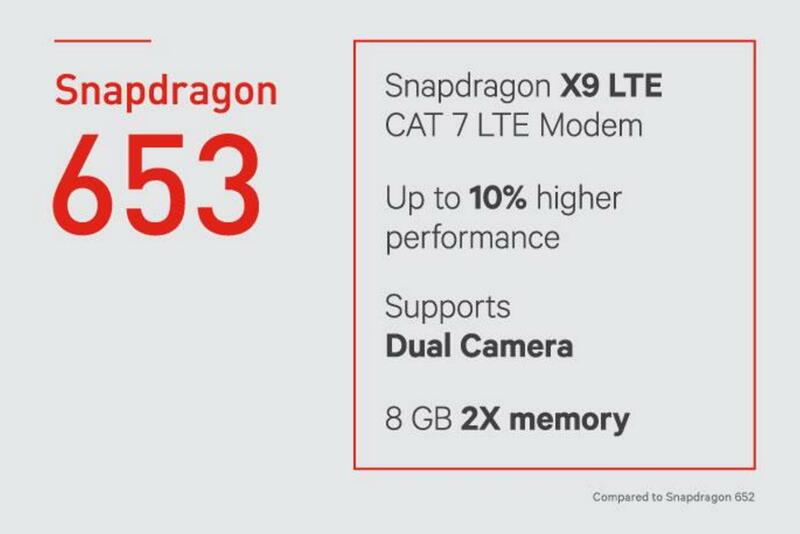 The Snapdragon 653 (MSM8976Pro), if you couldn't tell from the number, is the most powerful chipset of these three. 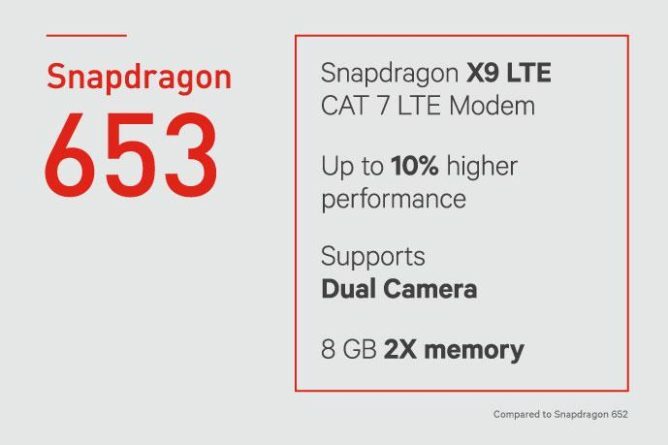 Qualcomm says that the 653 is intended to perform 10% better than the 652 it replaces, and achieves this with a maximum clock speed of 1.95GHz (the 652 could go up to 1.8GHz), support for up to 8GB of RAM (wow), better GPU performance, and other improvements in its architecture. It also adds Enhanced Voice Services, which apparently makes VoLTE calls sound even better. The 626 (MSM8953Pro) is also intended to be 10% better than its predecessor (the 625). It can be clocked up to 2.2GHz, up from the 625's maximum of 2.0GHz. This chipset also adds Qualcomm's TruSignal antenna boost, which helps improve signal reception in congested areas. Lastly, the 427 (MSM8920) gets the fewest visible improvements. It does get better CPU and GPU performance than the previous 425, although the details of this aren't elaborated on. Clock speeds remain the same when compared with the 425 (1.4GHz), although the X9 LTE modem is a huge jump over the 425's X6 LTE model. The 427 also gets the aforementioned TruSignal tech. Qualcomm expects the 653 and 626 to be commercially available by the end of 2016, and the 427 by early 2017. The company also announced several other new things today, which we'll have coverage on shortly. HONG KONG, Oct. 18, 2016 /PRNewswire/ -- Qualcomm Incorporated (NASDAQ: QCOM) today announced that its subsidiary, Qualcomm Technologies, Inc., introduced three new Qualcomm® Snapdragon™ processors aimed at supporting enhanced user experiences and connectivity for high performance and high volume mobile devices. The new Snapdragon 653, Snapdragon 626 and Snapdragon 427 processors are designed to deliver higher levels of processing performance than their predecessors. All three new processors are designed to support Qualcomm® Quick Charge™ 3.0 technology, designed to deliver power up to 4X faster compared to traditional charging methods. In addition, support for dual camera has been extended from the Snapdragon 800 tier to the Snapdragon 600 and 400 tiers, for clear imaging and photos across a wider variety of photo capture scenarios, to further enhance consumer experiences. 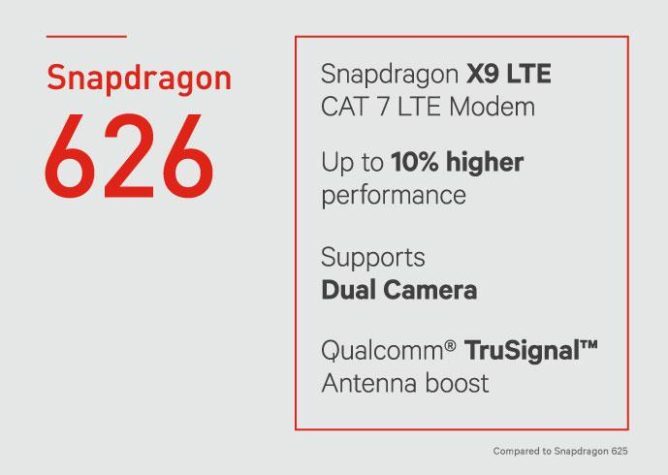 The Snapdragon 626 features a CPU performance increase over the Snapdragon 625. It also features Qualcomm® TruSignal™ antenna boost, designed to improve signal reception in congested areas. The Snapdragon 626 is pin and software compatible with Snapdragon 625, and software compatible with the Snapdragon 425, 427, 430, and 435 processors. The Snapdragon 427 delivers a CPU and GPU performance increase over the Snapdragon 425. It is the first chipset to bring TruSignal to the Snapdragon 400 tier of processors, designed to deliver unprecedented powerful antenna tuning to this high volume line of processor solutions. 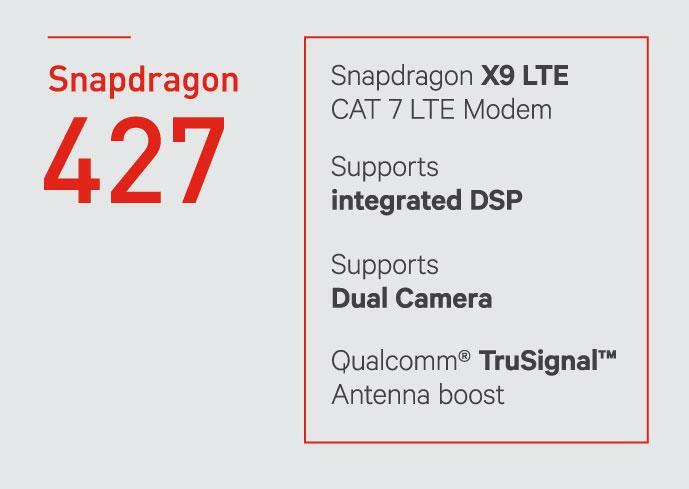 The Snapdragon 427 is pin and software compatible with Snapdragon 425, 430 and 435, and software compatible with Snapdragon 625 and 626. "It has always been Qualcomm Technologies' strategy to introduce industry-leading features first at the premium Snapdragon 800 tier design point, and then scale these features into our other Snapdragon products," said Alex Katouzian, senior vice president of product management, Qualcomm Technologies, Inc. "A great example of this strategy is the use of dual camera for capturing high quality photos that now range across our portfolio, including our 400 series mobile solution. Doing this allows our customers and smartphone developers to reach a broad subscriber base with advanced features and great end-user experiences." Additional Qualcomm Technologies announcements made today at the 4G/5G Summit include new solutions for connected smart cameras, and, broad ecosystem adoption of its LTE Category M1/NB-1 modem. Qualcomm, Snapdragon and TruSignal are trademarks of Qualcomm Incorporated, registered in the United States and other countries. Quick Charge is a trademark of Qualcomm Incorporated. Qualcomm Snapdragon, Qualcomm TruSignal and Qualcomm Quick Charge are products of Qualcomm Technologies, Inc.